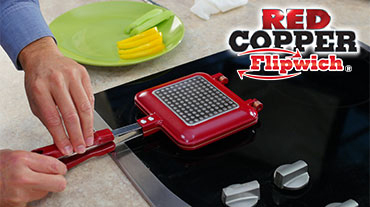 Red Copper Flipwich® | Official Site | Just Press, Flip, And Cook! Just Press, Flip, And Cook! Non-Stick Ceramic Lets You Grill Perfect Sandwiches In No Time! The perfect sandwich every time! Every day you can make the perfect sandwich with almost no effort! Amazing! Flips Easily With No Mess! No more worrying about spilling food when flipping your sandwich or getting it out of the pan without sticking! Tired of the same, boring, cold sandwiches? Do your grilled sandwiches suffer from filling fallout? Create perfectly grilled sandwiches without filling fallout blunders using the Red Copper Flipwich®! READ FULL DESCRIPTION Make hot sandwiches in minutes. Red Copper Flipwich® is lightweight, so flipping your sandwich is easy. Two interlocking grill pans coated with a non-stick ceramic surface create a twin chamber sealed environment for cooking your sandwich. This makes cooking faster and easier! Red Copper Flipwich® grills a variety of foods - gooey grilled cheese, sizzling wraps, and perfect paninis. You can even make a better burger! Try grilling 6 regular size hot dogs at once for parties or quick family dinner nights. Because Red Copper Flipwich® is non-stick and lightweight, stuffed French toast, indoor s'mores, pudgy pies, and bagel sandwiches are easy to make. Plus, Red Copper Flipwich® works on any stovetop - gas, glass, electric, and even induction! Stop serving boring sandwiches. Create fliptastic grilled sandwiches with Red Copper Flipwich®! Order Red Copper Flipwich® for only $19.99 plus $9.99 shipping and handling. When you order, you'll also receive the Fliptastic Foods and Desserts recipe book, as well as the Forever Sharp Knife with your order! But wait - takes advantage of our special offer and get a second Red Copper Flipwich®, recipe book, and Forever Sharp Knife. Just pay a separate fee of $9.99. Hurry, this deal won't last long. Place your order today! Just close the lid, lock the handle and flip! Red Copper Flipwich® is great for all kinds of treats - Make 6 hot dogs at once! OFFER: Get your Red Copper Flipwich for only $19.99 plus $9.99 shipping and handling. When you order, you'll also receive the Foods and Desserts recipe book, as well as the Forever Sharp Knife with your order! But wait - takes advantage of our special offer and get a second Red Copper Flipwich, recipe book, and Forever Sharp Knife. Just pay a separate fee of $9.99. UPGRADE to the Deluxe Red Copper Flipwich, featuring a special double-coated cooking surface. Your DELUXE OFFER includes a deluxe coating Red Copper Flipwich, recipe guide, Forever Sharp Knife, a 3-year guarantee - yours for only $29.98 plus $9.99 shipping and handling. Double your deluxe offer and receive a second deluxe coating Red Copper Flipwich. Just pay a separate fee of $19.98! Order now. GUARANTEE: Standard Flipwich Guarantee - Your satisfaction is 100% guaranteed. If you are dissatisfied with your Red Copper Flipwich for any reason, simply return the product within 30 days for an easy refund of your purchase price, excluding shipping and handling. See our return policy for more information. Exceptions may apply. Deluxe Flipwich Guarantee - Your Deluxe Double Coating Red Copper Flipwich has a 3-Year Guarantee that covers a 3-year lifespan of the product. Should anything happen to your Deluxe Double Coating Red Copper Flipwich under normal usage simply return the unit and you will receive your money back, less shipping and handling and/or depreciation. Mistreatment, misuse, and intentional abuse of Deluxe Double Coating Red Copper Flipwich is not covered under the 3-Year Guarantee. Choose Your Red Copper Flipwich® Offer Now!! Check out these other great products by Red Copper Flipwich®. TEXT FOR OTHER PRODUCT OFFERS. Hear from other Red Copper Flipwich® customers how much they love it, and why you will too! Check out all the news for Red Copper Flipwich® and its creators at TeleBrands featured all over the world.